A special “Knight Rider” Christmas treat comes early this year…A Hallmark Gold Crown Exclusive, available July 2013! By Keepsake Artist Orville Wilson, this one of a kind Knight Rider Christmas Tree Ornament will be the perfect addition to your Christmas tree this upcoming holiday. Priced at only $19.95, KITT comes battery operated with battery included. 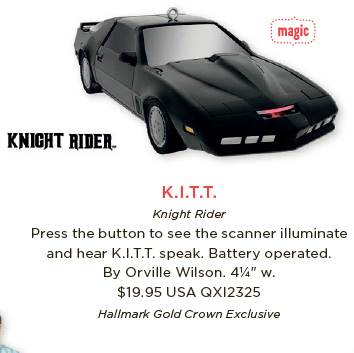 You can press the button to see the scanner illuminate and hear K.I.T.T. speaking to you. Head on over to KITT’s Page at hallmark.com to find a store near you and also check it out for purchase on hookedonhallmark.com. Scheduled to ship July 15th.